If you have never called Hornady Manufacturing, I highly suggest you do sometime. In an era of out-sourced call centers and a general devaluing of customer service, Horandy can still be found to have class and true dedication to their customers. Upon calling Hornady you are greeted by the ambiguous corporate answering machine that implores you to listen to the following options as they may have changed. Just about the time you are certain you have landed squarely is a depressing game of telephone maze button mashing to talk to a real person, the cadence of the recorded voice changes. You are assured the following options have not changed, and further, pressing zero at any time will take you to one of Hornady's friendly staff. Zero did indeed direct me to a very polite staff member who answered promptly and never used the dreaded "hold" button. I was amazed and shocked at how I was treated. It was as if I was a celebrity, and they had waited all day just for me to call. It was a breath of fresh air in an otherwise dingy, choking cloud of poor customer service that our consumer market place has become today. Why was I calling a leading bullet manufacture? We all have felt the pinch of ammunition shortages of late, and no one more so than those shooting the venerable 308 Winchester cartridge. This previous season I had sighted in my rifle using a 150 grain SST bullet in Hornady's Superformance line, SST 150gr Superformance. This is a jacketed, lead core bullet that boosts higher speeds and decent weight retention. I had achieved great accuracy with this round and used it to harvest both an antelope and a bear. The bullet had performed well on the animals and I was able to recover both of them. After examining the bullets, I was happy with their expansion. Unfortunately I had depleted my supply and no scouring of the internet or local gun shops could produce more of this rare resource. My hope was that Hornady would be able to direct me to where I could obtain my beloved SST round. My dreams were dashed when they informed me the round had not been in production for sometime, and they were not due to start again for another 45 days. With an Alaska caribou hunt looming in the near future, it became apparent that I would have to switch to a different bullet. A long conversation with one of Hornady's techs convinced me that the best substitution for the bullet was the GMX, or gilding metal bullet. GMX 150gr Superformance. This bullet is made out of a solid copper metal amalgamation and is Hornady's answer to a lead free bullet. Hornady boasts excellent weight retention upon impact, as well as good expansion as the ballistic tip opens the front of the bullet. An item to note is that this bullet must be driven at a minimum speed of 2000 FPS in order to expand optimally. This is opposed to the SST which has a lower minimum expansion speed of 1800 FPS. Looking at a ballistic table, this gives the 150gr GMX in Superformance an effective range of about 450 yards in the 308 cartridge. 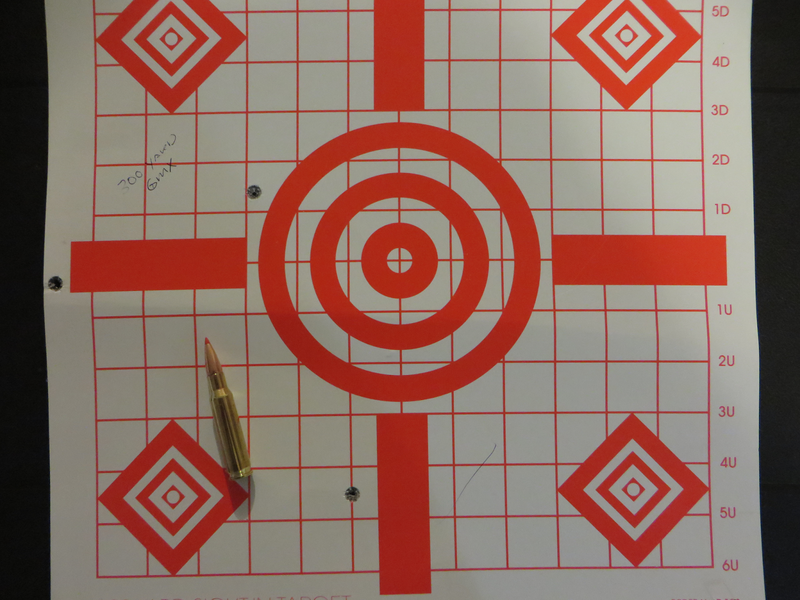 At 400 yards, the bullet is at 2101 FPS, and at 500 it is down to 1916 FPS. The SST is still effective past 500 yards as it is traveling at 1963 FPS at this mark in the same weight and cartridge. The drop rates also differ but only slightly. With my new bullet selected, I set out to find some of the beautiful red and gold boxes of said GMX ammo. With a little bit of luck I found some at my local Cabela's, but was shocked by the sticker price. $42 per box of 20 made each shot just a smidgen over $2 a round, a pricey sum for 308 ammunition. This was a steep price compared to the $27 per box for the same ammunition in the SST bullet. With my bullets purchase, rifle cleaned, and several new target stands built, I set off for the Colorado prairie to test and compare the two bullets out of my trusty custom AR10. My AR10 was built specifically for me by Colorado Mountain Sales, CMS Arms, out of Aurora, Colorado. It has an 18 inch stainless steel, free floated barrel made by Black Hole Weaponry. This specific barrel has 3 grove polygonal rifling, which is different than traditional enfield rifling. The upper and lower are built by DPMS, is their LAR10 series, and has a two-staged CMML match trigger group installed. Video about testing these bullets. Enough about the tech, its time to talk about how the bullets performed. On the first day of shooting it was 85 degrees with nearly no wind to speak of. I shot both bullets at the 200 and 300 yard mark. What I found was that the SST grouped much better than the GMX. When the sun set and I shut down my shooting for the day, there was a clear winner. Without a doubt the SST was the better bullet for my rifle. However, I ran out of time to compare the bullets at the 100 yard mark and still did not have my rifle absolutely zeroed in for the SST round. There was also the problem that I only had three of my beloved SSTs left, sitting lonely and abandoned by their brothers in a nearly empty 20 round magazine. Upon arriving home I once again searched for my SSTs. With a little direction from Hornady, this time I was able to locate some from an internet supplier. Several days later I had four boxes of the brass colored beauties on my doorstep. Day two at the range saw temperatures in the lower 90s and the winds were intermittent at 5 to 15 MPH. This made shooting difficult to say the least. After several groups at 200 yards I had to resign myself to the fact that I could make no determinations off any distance greater than 100 yards for the day. I shot several consecutive three shot groups of both ammunition and found the absolute opposite effect I had seen on day one. The GMX performed better than the SST. It appears the SST is more susceptible to wind than the GMX. One GMX group at 100 yards even saw two bullets go through the same hole. I ended the day shooting the GMX and SST at distance targets up to 400 yards. I found both bullets performed decently well despite the windy conditions. 100 yard GMX group, yes that is two bullets in one hole. My conclusion is that both bullets are good performers in the Superformance line. The ammunition itself functioned well in my AR10 and I never had a misfire or malfunction out of the approximate 100 rounds I fired. I will be sticking with the SST for now, based on past history, performance, and price. However, a few GMX'S will probably find their way into the ammunition box for windy days. Closing thoughts this time are my own: Practice and test your gear regularly, do not be the hunter that relies on luck or pure chance at the moment of truth.